HCA Chairman and CEO Milton Johnson was on hand for the opening bell celebration. 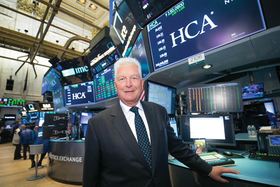 On Aug. 14, two members of a newer generation of the founding family, Thomas Frist III and his brother Bill, joined HCA Chairman and CEO Milton Johnson and several current senior officers to ring the New York Stock Exchange's opening bell. Today's HCA Healthcare, the nation's largest hospital chain by revenue, was founded in 1968. It went public in 1969 and was listed on the NYSE a year later. “Who would have imagined 50 years ago that we would have grown from one hospital in Nashville to an organization today with over 2,000 healthcare facilities treating nearly 30,000 patients a year,” said HCA Senior Vice President Vic Campbell, who during his 46 years with the company has seen it through several phases where it was private and then public. HCA was taken private in 1989 through a leveraged buyout, but became publicly traded again in 1992. Two years later it merged with Columbia Hospital Corp. to form Columbia/HCA. Frist Jr. returned to the company in 1997, when it reverted to HCA. While a second management-led LBO was completed in 2006, it became public yet again five years later. Today, HCA is among the better-performing for-profit hospital chains both quality-wise and financially, as it's been able to weather the industry's trends of decreasing admissions and lower revenue.